Mexico, 1868, Hidalgo (thin figures, imperf), 100c black on brown, pair and single, Cordova, cons 20-68, in combination with 1868, 50c black on yellow, three singles + 12c black on green + 6c black on buff all Cordova cons 20-69 (Scott 49, 59, 46), tied on piece by Cordova oval handstamps (Schatzkes 189), light crease affecting 100c single and one in pair and scuffing affecting one 50c, still Very Fine, a striking and unique four-color franking showpiece (NF $1,975 as singles); with 1983 Jaretzky and 2005 M.E.P.S.I. certificates. Scott No. 50 Estimate $750 - 1,000. Mexico, 1868, Hidalgo (thin figures, perforated), 100c black on brown, Guanajuato, cons 6-69, in combination with 1868, 50¢ black on yellow, Guanajuato, cons 6-68 on judicial front to Salamanca, tied by neat Irapuato boxed handstamp (Schatzkes 496), official eagle cachet handstamp at left, Very Fine, a wonderful exhibition item, ex-Stout; with 2010 M.E.P.S.I. certificate. Scott No. 56+55 Estimate $400 - 600. 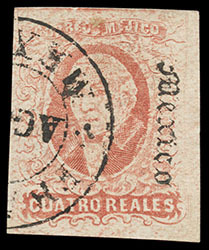 Mexico, 1868, Hidalgo (thin figures, perforated), 100c brown on brown, horizontal strip of four, Queretaro, cons 12-68, in combination with 1868, Hidalgo (thick figures, perforated), 25c blue on pink, Queretaro, cons 12-68 on large judical front to Yrapuato, tied by fancy oval Salamanca handstamps (Schatzkes 1331), light oval eagle cachet handstamp at left; couple file fold not affecting stamps or markings, Very Fine; with 1983 Jaretzky certificate. Scott No. 57+68 Estimate $2,000 - 3,000. A WONDERFUL AND RARE MULTIPLE FRANKING OF THE 1868 100C BROWN ON BROWN FULL FACE HIDALGO ISSUE. Mexico, 1868, Hidalgo (thick figures, imperf), 6c black on buff, Matamoros, horizontal pair, in combination with 1868, 12c black on green, Matamoros, both cons 9-71, and additional 1868, 12¢ black on green, Tampico, cons 39-71 cut from an uncanceled letter, on July 1872 folded letter from Matamoros to Guanajuanto, carried privately by agent Enrique Duprat of Tula de Tamaulipas with oval handstamp on reverse, entered the mails in San Luis Potosi with 1872, 12c blue + 25c red, San Luis Potosi, cons 37-72 affixed and all stamps canceled by fancy "Franco" handstamps (Schatzkes 1461), Very Fine, a unique unaccepted demonetized and postal fraud usage bearing stamps from three different districts, ex-Rosenthal; signed Lami and Calves, with 1987 M.E.P.S.I. certificate. Scott No. 58+59+94+95 Estimate $3,000 - 4,000. 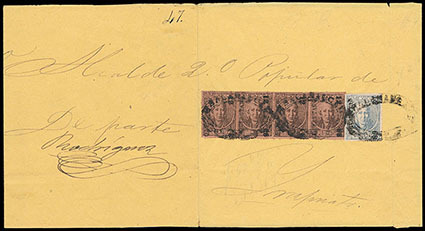 This cover not only was sent 3 months after the 1868 Full Face Hidalgo issue was demonetized, but was initially franked with stamps from two different districts. 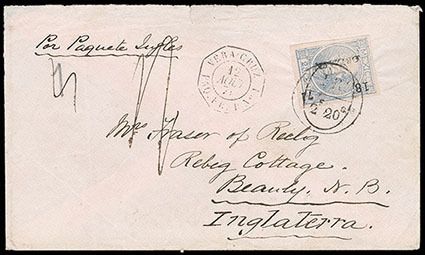 Mexico, 1868, Hidalgo (thick figures, imperf), 25c blue on pink, Orizava, cons 18-71, on cover to Beauly, England endorsed "Por Paquete Ingles" but sent by French packet instead, tied by faint Orizava circular cancel (Schatzkes 1789) and "I.R./2f 20c" circular accountancy handstamp, "Vera Cruz, Paq. Fr. B No. 1, 12 Aout, 71" octagon handstamp alongside, "1/-" British rating with "1" Orizava rate handstamp crossed out, receiving backstamp, Extremely Fine and rare. Scott No. 61 Estimate $600 - 800. 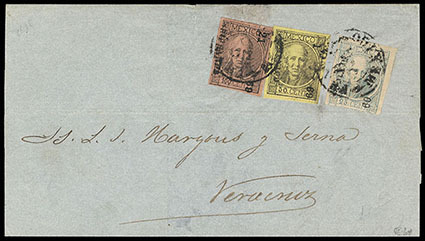 Mexico, 1868, Hidalgo (thick figures, imperf), 50c black on yellow, Morelia, cons 10-70) canceled (portion of circular postmark at right) and re-used on cover to Mexico, tied by San Juan del Rio (Queretaro) boxed date stamp (Schatzkes 1320), Very Fine, a postal fraud and an out-of-district usage. Scott No. 62 Estimate $150 - 200. 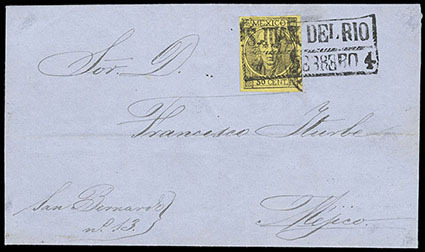 Mexico, 1868, Hidalgo (thick figures, imperf), 50c black on yellow, block of six, Veracruz, cons 2-70, with three stamps no period after "50" variety, margins mostly large to just shaving frameline at lower left, canceled by two strikes of Cosomaloapan boxed handstamp (Schatzkes 1782) on judicial front to Veracruz, embossed oval Cosomaloapan eagle cachet at left, Very Fine, ex-Larranaga; with 1983 Jaretzky certificate. Scott No. 62, 62a Estimate $2,000 - 3,000. THE LARGEST KNOWN USAGE OF THE 1869 50C LARGE FIGURE FULL FACE HIDALGO ISSUE. 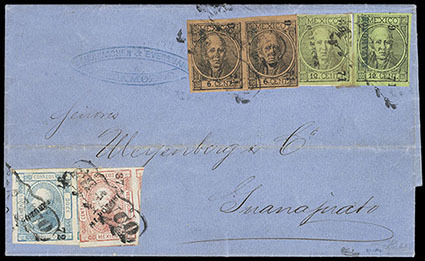 Mexico, 1868, Hidalgo (thick figures, imperf), 100c black on brown, Chihuahua, cons 21-69, in combination with 1868, 25c blue on pink + 50c black on yellow, Mexico, cons 1-69 on folded letter sheet to Veracruz, all tied by Mexico cds (Schatzkes 821), Very Fine and choice, a lovely 3-color mixed district franking. Scott No. 64+61+69 Estimate $200 - 300.